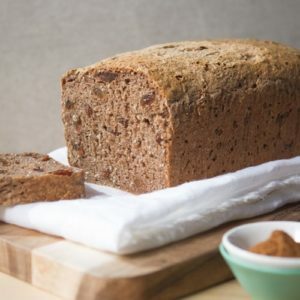 A soft and springy gluten free fruit spice loaf – made with a blend of buckwheat and sorghum flours, this recipe is jam packed full of sultanas and spice. It smells divine as it cooks and keeps fresh in a paper bag on the kitchen counter. 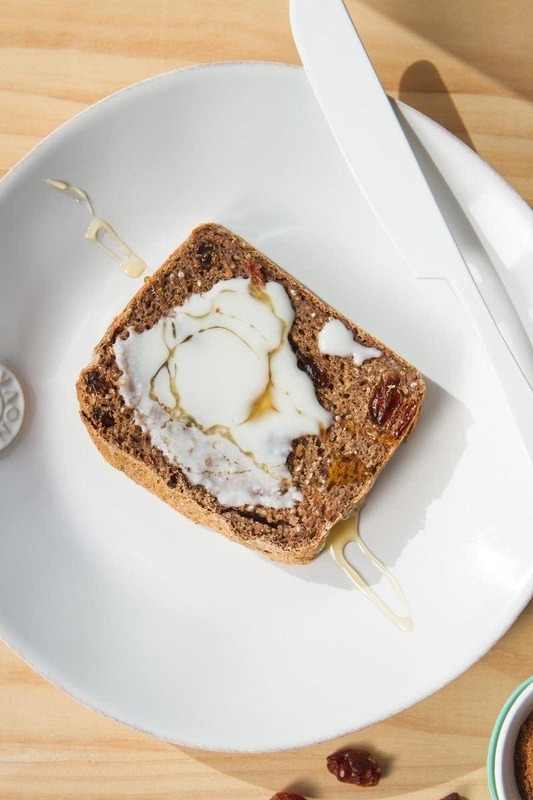 Yes you can make this in a bread maker! 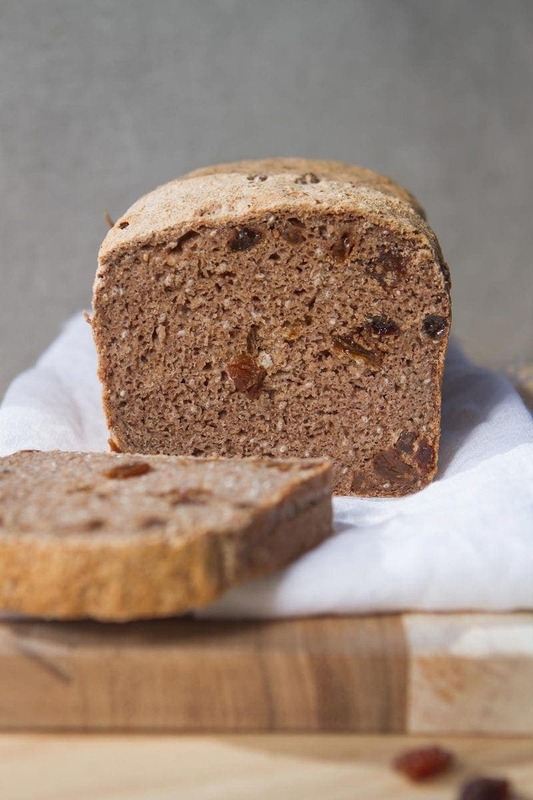 This bread is an adaptation of my classic Gluten Free Buckwheat Millet Bread. I have replaced the dense millet with sorghum flour as it is lighter and with a slightly sweet rather than nutty taste. 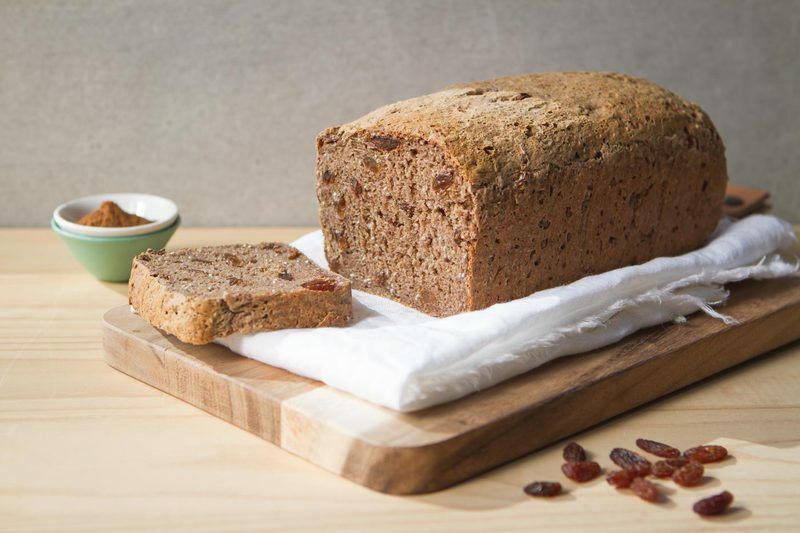 This bread will rise very nicely with the help of the extra sweetness from the sultanas. It is absolutely delicious toasted up with lashings of coconut butter. Raspberry chia jam would also be an amazing idea. Best stored in breathable paper, wrapped snuggly on the counter. 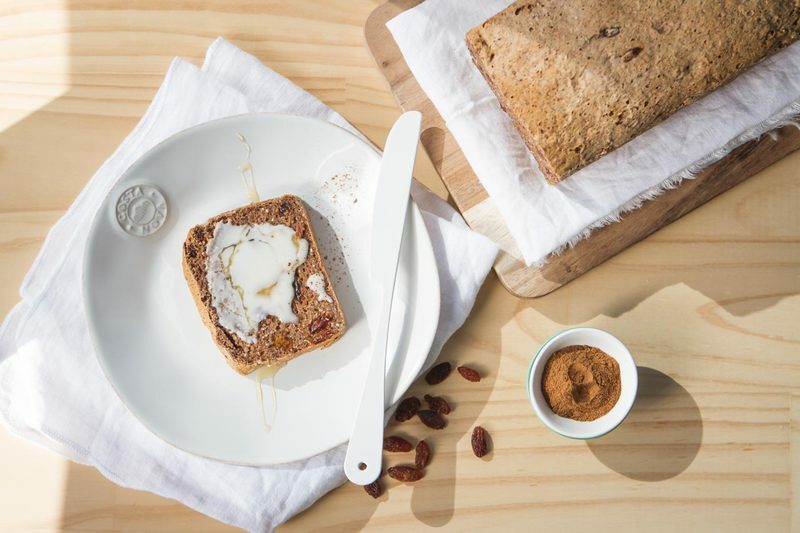 A delicious, soft and slightly sweet Gluten Free Fruit Spice Bread. Made without any dairy or eggs. Please note that the active prep time does not include the hour it takes for the bread to rise. Yields one loaf with 14 slices (1.75cm per slice). Line a rectangle bread tin with baking paper and set aside. Add sugar and yeast to ½ cup warm water, give a little stir, and set aside for ten or minutes until the yeast blooms and froths. Meanwhile, sift the buckwheat and sorghum flour, tapioca starch, baking powder, spices and salt into a large mixing bowl. Add chia seeds and sultanas. Mix to combine. In a blender, whiz the remaining 1½ cups + 2 tablespoons warm water with the psyllium husks for 15 seconds. Make a well in the centre of the dry ingredients, pour in psyllium husk mixture, coconut oil and yeast mixture. Use a spatula to fold the mixture together in what I call a ‘batter-dough’! Pour batter-dough into bread tin. Place a layer of cling wrap snuggly over the surface. Place bread tin in a warm spot and let rise for around an hour. This may take longer in colder weather. If room temperature is too cool, try my bread rising hack: warm a heat pack up and wrap in a towel, then sit bread tin on top. 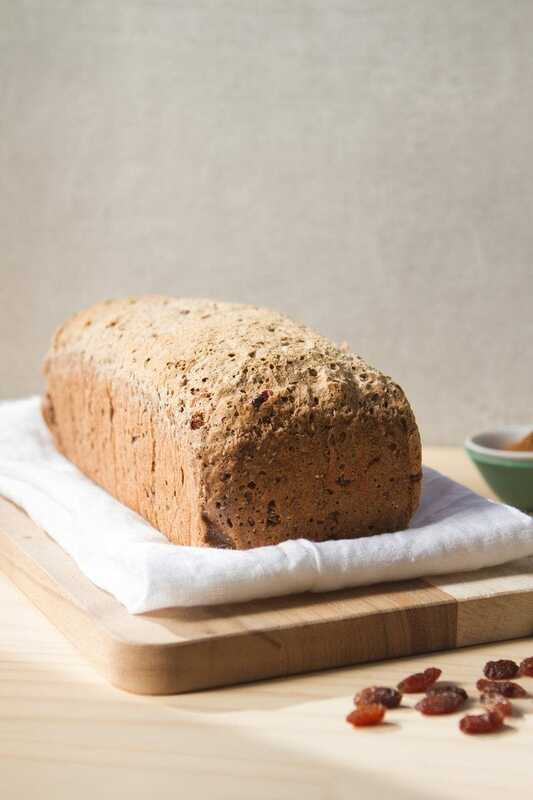 The trick is to keep a constant temperature – not too hot – otherwise the bread will rise too fast and collapse in the oven. After an hour, remove cling wrap and place bread tin in a hot oven. Bake (force fan) at 180˚C for 35-40 minutes. Once cooked, remove from bread tin and let cool before slicing with a serrated knife. I've had a lot of great feedback on both this loaf and the gluten free buckwheat and millet loaf - it's been made and shared countless times on social media. With this particular recipe, I've noted many people comment they added more sultanas - some a lot more. So if that's your vibe, go for it!